More Frame Rate With Better Graphics! On April 4th 2019, Oculus launched Asynchronous Space Warp 2.0, which is a newer method of raising frame rate, by laglessly converting 45 frames per second to 90 frames per second for Oculus Rift Virtual Reality headsets, which is perfect timing for this Blur Busters featured article. In the future, instead of low-detail 240fps, one can amplify high-detail 60fps into high-detail 240fps, allowing you to have cake and eat it too on your gaming monitor! Increasing frame rates with less GPU horsepower, is a huge area of innovation at the moment. High-Hz displays hugely benefit from Frame Rate Amplification Technologies (FRAT) – our umbrella term that describes technologies to increase frame rates with less GPU horsepower per frame. This can also include gaming monitors, and not just virtual reality headsets. These are just only the publicly released technologies! This article is derived from a forum thread that I originally publicly posted in August 2017, but updated with new FRAT technologies publicly announced! The Oculus Rift VR headset included a method of reprojecting 45 frames per second to 90 frames per second, thanks to Oculus Asynchronous Space Warp (ASW). Keeping frame rates high in virtual reality is a critical mother of necessity, because stutters can cause headaches and nausea in virtual reality. Oculus’ release of Version 2.0 of Asynchronous Space Warp is currently one of the better lagless & artifactless implementations of Frame Rate Amplification Technology (FRAT). For those not currently aware, see How Blur Busters Convinced Oculus Rift To Go Low Persistence for some newly revealed Blur Busters history in accelerating low persistence in VR. There are many similar equivalent reprojection techniques to Oculus ASW at competing virtual reality headset vendors including PIMAX BrainWarp and HTC Vive Motion Smoothing. A new paper by University of Cambridge has revealed a brand new frame rate amplification technology, for IEEE VR 2019 by co-authors Gyorgy Denes, Kuba Maruszczyk, George Ash, and Rafał K. Mantiuk. Basically, the technique is to create low-resolution frames between high-resolution frames, and then upconvert the low resolution frames using the information from the high-resolution frames. This FRAT can lower frame transmission bandwidth over video cables (or video streaming), and offload this algorithm to the display side. This FRAT can also potentially also be useful for streaming full power virtual reality from powerful tower computer to low-powered wireless VR headsets (such as Oculus GO). NVIDIA released Deep Learning Super Sampling (DLSS) when they launched GeForce RTX. While not yet as perfectly artifactless as Oculus Asynchronous Space Warp 2.0, it is a great first implementation from NVIDIA, and can only improve from here. Currently, it does not yet provide major frame rate amplification ratios (like 2:1 or 5:1 frame rate increases). This is not a “between-frames” Frame Rate Amplification Technology (FRAT) like the other technologies. All frames are rendered lower resolution and then upconverted using AI. It includes many FRAT attributes of other existing techniques such as artificial intelligence (including AI Interpolation) and lower resolution frames (like Temporal Resolution Multiplexing). Since the beginning of this century, many HDTVs had interpolation to convert 60 frames per second to 120 frames per second. Historically, interpolation was very high latency with very bad artifacts, and unsuitable for gaming. Recently, this is changing with newer more modern AI interpolation in new TVs. There is a huge number of scientific papers on motion interpolation, and older 1980s papers on interpolation for television format conversion (between PAL 50Hz and NTSC 60Hz). To reduce lag, the 2018+ Samsung televisions now has low-lag Game Motion Plus interpolation mode for gaming consoles, to amplify frame rates from 30fps-60fps into 120fps! A popular PC application for amplifying frame rates of video files, is Smooth Video Project. Although classic interpolation is the oldest frame rate amplification technology dating back twenty years, innovations continue in improving video motion interpolation. Not necessarily anymore! In the past, classic interpolation added very fake-looking frames in between real frames. However, some newer modern frame rate amplification technologies (such as Oculus ASW 2.0) are less black-box and more intelligent. 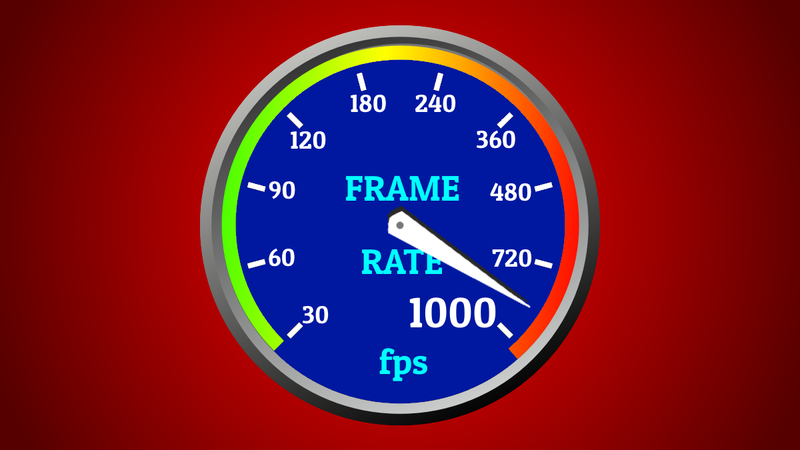 New frame rate amplification technologies use high-frequency extra data (e.g. 1000 Hz head trackers, 1000Hz mouse movements) as well as additional information (texture memory, Z-Buffer memory) in order to create increasingly accurate intermediate 3D frames with less horsepower than a full GPU render from scratch. So don’t call them “Fake Frames” anymore, please! Many film makers and content creators hate interpolation as they don’t have control over a TV’s default setting. However, game makers are able to intentionally integrate it and make it as perfect as possible (e.g. intentionally providing data such as a depth buffer and other information to eliminate artifacts). When you are watching video and films, using Netflix or YouTube or at digital movie theaters, you’re already watching material that often contains approximately 1 or 2 non-predicted frames per second, with very accurate predictive frames inserted in between them. Modern digital video and films use various video compression standards like MPEG2, MPEG4, H.264, H.265, etc. to generate the full video and movie frame rates (e.g. 24fps, 30fps, 60fps, etc) by using very few full frames and filling the rest with predicted frames! This is a feature of video compression standards to insert “fake frames” between real frames, and these “fake frames” are now almost perfectly accurate, that they might as well be real frames. The remainder of video frames are “faked” by predictive techniques via P-Frames and B-Frames. Yes, that even includes the frames at the digital projector in your local movie theater! 3D Rendering Is Slowly Heading Towards Similar Metaphor! Towards year 2030, we anticipate that the GPU rendering pipeline will slowly evolve to include multiple Frame Rate Amplification Technology (FRAT) solutions where some frames are fully rendered, and the intermediate frames are generated using a frame rate amplification technology. It is possible to make this perceptually lossless with less processing power than full frame rate. Some FRAT systems incorporate video memory information (e.g. Z-Buffers, textures, raytracing history) as well as eliminating position guessing (e.g. 1000Hz mouse, 1000Hz headtrackers) to make frame rate amplification visually lossless. Instead of rendering at low-detail at 240fps, one can render at high-detail at 60fps and use frame rate amplification technology (FRAT) to convert 60fps to 240fps. With newer perceptually-lossless FRAT technologies, it is possible to instead get high-detail at 240fps, having cake and eating it too! The higher the frame rate, the briefer individual frames are displayed for, and the less critical imperfections in some interframes become. We envision large-ratio 5:1 or 10:1 frame rate amplification to be practical for converting 100fps to 1000fps in a perceptually lagless and lossless way. Ultra-high-Hz also behaves like a strobeless method of motion blur reduction (blurless sample-and-hold), as twice the frame rate and refresh rate halves display motion blur on a sample-and-hold display. 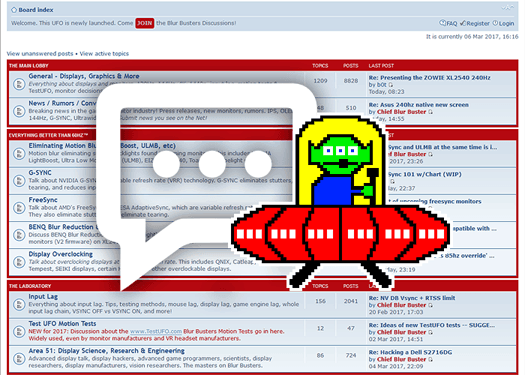 Our namesake, Blur Busters, was born because of display motion blur reduction technology that is found in many gaming monitors today (including LightBoost, ULMB, etc). These use impulsing techniques (backlight strobing, frame flashing, black frame insertion, phosphor decay, or other impulsing technique). With current low-persistence VR headsets, you can see stroboscopic artifacts when moving head super very fast (or rolling eyes around) on high-contrast scenes. Ultra-Hz fixes this. A small but not-insignificant percentage of humans cannot use VR headsets, and cannot use gaming-monitor blur-reduction modes (ULMB, LightBoost, DyAc, etc) due to an extreme flicker sensitivity. Accommodating a five-sigma population can never be accomplished via strobed low-persistence. Ultra-high-framerate sample-and-hold displays makes possible blurless motion in a strobeless fashion, in a way practically indistinguishable from real life analog motion. The only way to achieve perfect motion clarity (equivalent to a CRT) on a completely flickerless display, is to display sharp, low-persistence frames consecutively with no black periods in between. Achieveing 1ms persistence on a sample-and-hold display, requires 1000 frames per second on a 1000 Hertz display. Several public posts suggests this idea. In the far future, it is possible that frame rate amplification technology may end up as a co-GPU that is built into future displays, to reduce frame transmission bandwidth (e.g. 4K 1000Hz or 8K 1000Hz), in order to convert unobtainium into the possible. Future co-GPUs in displays may also decode 3D geometry based framerateless video formats. A futurist view is that video may someday eventually be compressed via 3D-geometry rather than traditional macro-block based compression. A far-future “H.268” or “H.269” 3D geometry codec. This may allow UltraHFR with crystal-sharp real-time 1000fps imagery, as traditional video is softer than computer graphics. Ultra-high-Hz displays require ultra-sharp sources for maximal visible human benefits. Fascinated about ultra high frame rates on ultra high refresh rates? IMO the better alternative to extreme refresh rate displays (i.e., 1 kHz+) is sub-1 ms strobing on displays with high but not insane refresh rates (say, 240 Hz) combined with eye tracking and screen-space motion blur. Rather than doing motion blur of surfaces relative to just screen space inter-frame displacement vectors, you do the motion blur relative to the delta between on-screen motion and gaze travel vectors. So anything you’re actively tracking (delta between on-screen motion and eye motion of zero) is unblurred strobed images, and moving things you’re not tracking exactly get correct, viewer-specific blurring. This is drastically computationally cheaper than frame interpolation, and it actually gets cheaper the more blur happens. Knowing the motion delta vector early allows anisotropic subsampled shading as well as a cheaper later motion blur kernel that can take advantage of pixels already given a degree of partial low pass filtering. Granted there will always be some portion of the population that has issue with any given refresh rate (strobed 120 Hz on non-trivially narrow FOVs gives me splitting headaches), but I suspect that it will be much more efficient for single-viewer setups to do exact computed blurs instead of brute force whole frame interpolation. Gaze tracking for foveated rendering/smart shading density is probably inevitable anyway given the computational wall GPUs are fast approaching, and gaze-compensated motion blur is a very easy add-on once that’s established. Yes, that’s a good interim step, though only a stopgap. There is the problem of microstuttering in games. The lack of motion blur makes microstutters much more visible on lower frame rates. Strobed displays often looks very jittery unless you turned on VSYNC ON (preferably using a low-lag method, like VR uses). Unsynchronized motion at 240fps still has noticeable stutters unlike unsynchronized motion at 1000fps. Strobing requires VSYNC ON at lower refresh rates to look really good, and many esports players hate that. Also, strobing is mostly incompatible with variable refresh displays. Simply doing sheer brute-Hz actually looks like per-pixel VRR. Four video windows playing simultaneously, 24fps, 50fps, 59.49fps and 60fps, all plays simultaneously smooth on a fixed-Hz 1000Hz display, because the refresh roundoff effect is so tiny. If you have never seen the stutter-erasing benefits of variable refresh, see TestUFO VRR Simulation. Also, consider the “five sigma human population” factor. Also, sometimes people get eye pain from the stroboscopic effect (phantom arraying) rather than eye pain from the direct flicker. This dramatically raises the Hz threshold of pain, and 240Hz is too low to bypass this human pain/nausea/headache threshold for five-sigma human population. 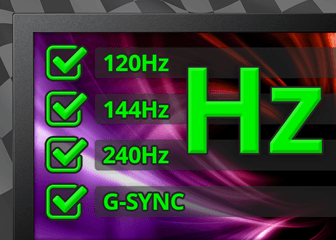 We may actually settle for 240Hz strobing for a long time (nonwithstanding the fact that I know there are humans with 240Hz strobe sensitivities). People get searing eye pain from 864 Hz PWM dimming, and there are already lighting industry studies that 20,000Hz is needed for AC-flickering fluorescent lights needed to use 20KHz ballasts to satisfy the whole human population. Avoiding strobing and simply using brute-Hz, solves a lot of these problems. 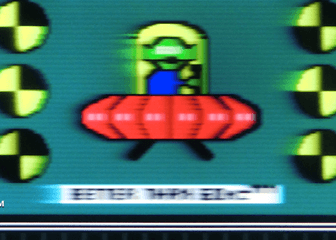 And even phantom array effects are still slightly visible at 1000Hz (see Blur Busters Law And Amazing Journey To Future 1000Hz Displays), though one can add a very minor GPU motionblur effect (but only 1ms needed) to erase the remainder of the phantom arraying / wagon wheel effects / etc. And, even 1000Hz may not be the final frontier this millennium, although 1000Hz is a pretty good number that jumps past the majority of the diminishing curve of returns. The longterm humankind progress is still going to be towards retina refresh rates — whether ten years or a century — it has now become possible in the laboratory. Our prediction is that it’s commercialized within the next decade at the premium legaues. 1000Hz displays will hit stage (2) during the next decade, but it might take 50 years for 1000Hz to go stage (4) or (5). Twenity years ago, doing anything at 8K was a pipe dream back in the 3Dfx Voodoo 512×384 resolution days. Today, I can run GLQuake at >1000fps on a $299 GPU at a full 1080p. The bottom line is once 1000Hz is only a $50 or $100 feature (mark my words: it will, someday, this century) — it will exist anyway, much like 4K and 8K even in contexts that becomes unnecessary 90%-99% of the time. Scientists are no longer are hand-wavey about 1000Hz. There are tons of benefits that are more than expected when you actually see hundreds of displays like Blur Busters. Including a large number of laboratory displays. Thanks for the response. I don’t think I follow how interior illumination flicker characteristics would carry over to sub-kHz strobed displays with eye-tracking based blur though. Stroboscopic effects stem from distinct illumination pulses leaving multiple retinal impressions of objects/patterns with spatial detail and/or inter-pulse traveled angular distances large enough to be at or near the level of perception. Real-world lighting can’t selectively alter the duty cycle of what it illuminates based on a room occupant’s shift in gaze and can only ramp up frequency (or decrease peak-to-trough amplitude), but there is no reason raster displays can’t be trickier. It seems to me that just as strobe duty cycle manifests as visual/perceptual spatial effects, computational spatial blur should be able to mask temporal characteristics of strobing beyond the point of perception. This might require radically better control of timings for frame rendering, frame transfer, and display strobing in order to deal with micro-stutter, but I feel like this is the shorter path to flicker-free motion clarity than brute force frame rates. Today, displays a bigger and cover a bigger FOV than yesterday’s displays. A retina-sharp flickering display thus, becomes indistinguishable from a flickering strobe backlight in a real room, in terms of how it affects stroboscopic effects. At the medium scale, this animation really hurts some human eyes because TestUFO Eiffel Tower at 3000 Pixels/Second. Use a fixed gaze, and you see stroboscopic effect. Move a tracking gaze, and you track moving eyes on it, you will see display motion blur. Now if you use low-persistence strobing, the motion blur disappears. But the stroboscopic effect is still there. 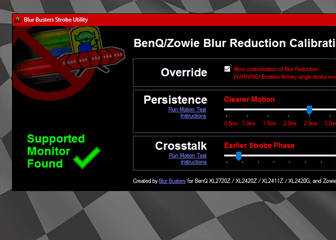 Now, you fix stroboscopic effect by adding intentional motion blur to the source imagery. That fixes stroboscopic effect in fixed-eye-gaze, but now it’s blurry even in strobed mode even on a 240Hz monitor. Ouch. Now you’ve got to jack up the Hz to solve this problem. You cannot simultaneously fix stroboscopic effect and motion blur at the same time via low-Hz strobed low-persistence (even 240Hz). It’s law of physics confirmed in tests — and will never be able to pass the Holodeck Turning Test (blind test of wearing ski goggles versus VR headset, and tricking a person that VR is real, and real is VR). Now, you can use eye-tracking-aware GPU-blur-effect algorithms, as another workaround. GPU-blur the motion only in fixed gaze effects, and disable it when eye-tracking along the motion axis. This is doable for virtual reality displays, but not for flat panel displays that multiple people are viewing — e.g. 1000Hz projection display would be an easier way to solve this problem on a shared-view display. VR is sole-user, and rapid-pans happens so frequently in virtual reality (head turnings = fast screen pans). So that’s a perfect place to add eye-tracking-compensated motion-blur-adding/avoiding algorithms for anti-stroboscopic-effect algorithms. That can avoid ultra-Hz altogether, as long as the human is tolerant of the high-Hz flicker (240Hz is well beyond flicker fusion thresholds, but not high enough eliminate phantom arraying / stroboscopics / wagonwheel effects even for moderate speeds). That said physical displays as well as projection screens (specialized cinema for ultra-reality-immersion use cases, etc) — it’s just not possible. 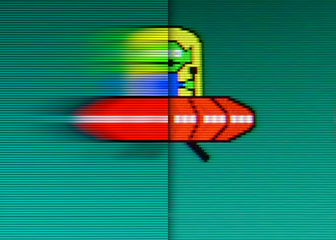 You can fix stroboscopics, or you add intentional motion blur (of one refresh cycle) to fix stroboscopics. Even a 1/240sec camera blur is visible during fast sports action shots, especially when we’re considering wide-FOV displays of retina resolution (the vicious cycle effect of higher resolution wider-FOV displays requiring higher Hz to mask visual differences between static images versus moving images). There are other tricks that can avoid ultra-Hz like moving displays that scroll physically with the movement of eye gaze, but requires sub-millisecond latency response, so another difficult challenge. Everybody sees differently and it is amazing how different humans are — one stat said 12% is color blind, and there’s varying degrees. Also, even if you see perfectly, your color primaries may be off by a few nanometers (or fractions) off the reference. Or you might have some motion blindness (Akinetopsia), there’s also many forms of undiagnosed motion insensitivities and extreme motion sensitivities. We’ve found that the same also applies to various kinds of stroboscopic phenomena (even the mere discomfort of a mouse arrow stroboscopic – not even to say the uncomfortable flickering-edge stutter of low-framerate motion). Some people just aren’t picky, and others just say they can’t stand to stare at a display for prolonged periods despite all fiddling of Low Blue Light or other ergonomic settings. Being Blur Busters, tens of thousands try to research the best display for them, and we have gotten a lot of anecdotes of surprising display sensitivities/insensitivities. To try to go five-sigma on all of them is going to be stupendously difficult on the same display surface. That said, ultra-Hz is much closer to real Holodeck for VR. Eye-tracking compensated low-persistence/motion-blurring for stroboscopics-elimination algorithms — will probably bring it closer to five sigma, but that’s for sole-view (e.g. VR) displays rather than multi-view displays or cinema screens, etc. And some further study may be needed to see if 240Hz is enough for five-sigma satisfaction (e.g. extreme flicker sensitivity issue) and or reliable passes of the theoretical Holodeck Turing Test (reliable tricking of a human that VR environment is real world). Also, tests like TestUFO Persistence can never look clear on any 240Hz display (high persistence or low persistence). So there will always be visible human limitations. Test this test at 60Hz, 120Hz, and 240Hz and you will see that the optical illusion gets twice as sharp at twice the refresh rate. The real world metaphorical event is picket fence + rapid horizontal motion. Or a fine grating. Or even as fine as seeing things through a screen door. Or staring at a world by head waving through a coarse-knit yarn blanket. Etc. Refresh rate limitations produce visible effects with those, too — especially when you’re getting to retina sizes at wide-FOV (ala VR). And even today they are visible at low resolutions; a retina VR headset (of full FOV) doesn’t exist, also given lens limitations too (Higher resolution reveals Hz limitations better, see Vicious Cycle Effect). As you can see from TestUFO Persistence example, even a 240Hz (of any kind, low persistence or not), will always have visible limitations that diverges from real-world, and never easily pass Holodeck Turing Tests reliably for fast motions of challenging material. Complex compensation algorithms and other complex workarounds could help, but then at some point, now it becomes simpler engineering-wise to simply quadruple the refresh rate (or a bit more — e.g. 2000Hz) and simply use a more universal FRAT. More on the Vicious Cycle Effect, we never needed ultra-Hz until now because no such thing as a retina display existed until only a few years ago (even things like IBM T221 from less than twenty years ago was only almost retina). And we were so focussed on increasing resolutions. And increasing computer performance. The diminishing curve of returns is quite true though, but the vanishing point is quite far away. Surprisingly so, thanks to the Vicious Cycle Effect. I agree that viewer-specific motion blur can only work in cases where there’s a single viewer present, but that’s not specific to only VR. Pretty much any form of interactive gaming is single-viewer nowadays, with some local co-op still available on consoles but not even the general case anymore. Any sort of filmed content has a harder time utilizing this method, since image content is not rendered with precisely known per-pixel motion vectors, but the solution is just higher frame rate capture and replay, so no arguments there. I just think that most gaming can get away with cheaper techniques that super-high frame rate interpolation, since multi-viewer setups are the exception, and foveal tracking will become increasingly necessary just to keep improving perceptual quality of interactive rendering. True, the definition of “good enough” — example of going 95% population to 99.9% population — while not five sigma, is a massive jump. Always a good simpler technological goal to strive for. Mind you — we’re not just FPS alone. Blur Busters — The Perfect Motion Company — is also about video HFR, cinema HFR, virtual reality, AR, mobiles, non-game motion blur reduction, and other use cases other than game playing too. 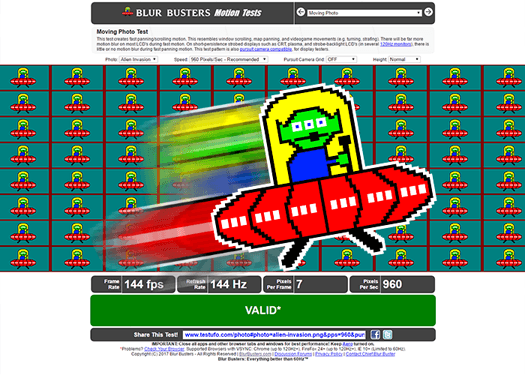 Blur Busters cover the whole sphere of motion blur reduction on all displays — of all kinds — of all purposes. Beyond the flicker/stroboscopic issue — there is a lots of other factors like vertigo and motion sicknesses (disjoint between real motion and virtual motion). Some surprising observations are made that some people who formerly could not tolerate FPS games nor watch Real3D cinema, had no problems standing on a virtual beach flying a kite on a well-adjusted Oculus Rift virtual reality system with perfect real/virtual motion sync. The well-tuned Oculus Rift has appareently successfully out-sigma’d Real3D in that respect, at least when playing the most “Comfortable” VR games (definitely non-roller-coaster). So there’s a whole other ball of wax of research going on there too as well. We anticipate the 21st century to be full of all the progress that you describe — in concurrent to simultaneous progress towards more perfectly reproducing analog framerateless motion. The latter is almost unobtainium but finally no longer impossible. Its discovered benefits is virtually guaranteed to provide a continuous (even if slow) refresh rate race this century, as other weak links are reduced/extinguished one by one. But where will these technologies leave us in terms of input lag? Is it correct to assume that locking ASW to 45 FPS will represent something similar to a V-Sync input lag where a simulation could benefit from running at ~90 FPS or the Oculus renderer pipeline applies some magical techniques? Even if one drops all the lag possible the game loop would be constrained to that cadency, correct? Tried it in Assetto Corsa Competizione and yes it gives us a chance to experience it visually how it should but at a lower frame rate. It can be negligible lag, and in some cases, lower effective lag than the original frame rate if Quick Frame Transport (QFT) is taken into account. Also, Oculus Asynchronous Spacewarp has less input lag than 60Hz VSYNC ON. Also, for future FRAT for ultra-Hz monitors like 240Hz, 480Hz, and 1000Hz — a 1 refresh cycle of input lag at 1000Hz is only 1ms, unlike 1/60sec = 16.7ms for 60Hz. We believe this to become less and less of an issue as refresh rates go higher, especially as the lack of motion blur and stutter can actually add some competitive advantages that compensate. 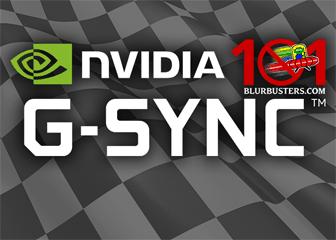 For future 1000Hz+, the lag differences and visual differences of VSYNC ON, VSYNC OFF, G-SYNC, FreeSync — practically disappear. Ultra-Hz looks like per-pixel VRR. Multiple concurrent frame rates (e.g. 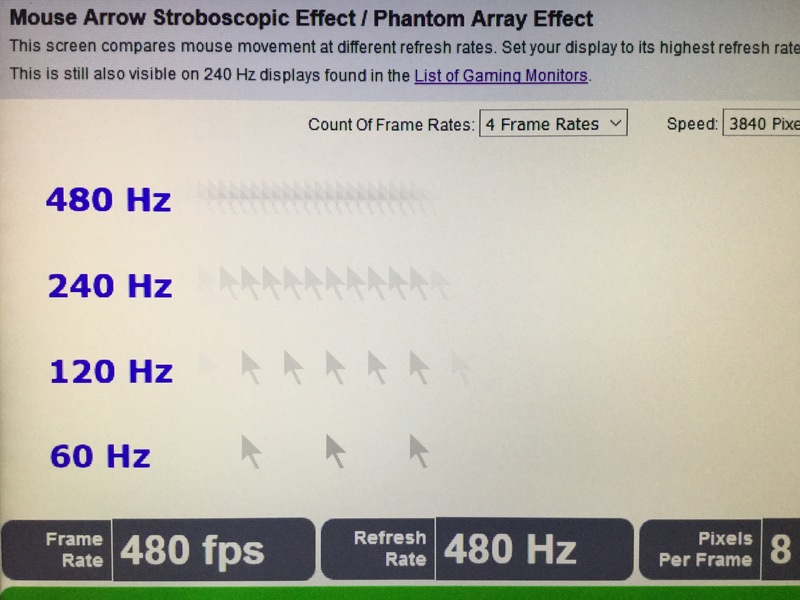 windows of 24fps, 25fps, 59.94fps, 60fps) all simultaneously look smooth on a 1000Hz display. All thanks to sheer brute Hz and negligible refresh granularity (no stutter/judder). The “per-pixel variable refresh rate” effect of brute Hz is quite apparent. 24fps looks like original 24fps (25Hz). 25fps looks like original 25fps (25Hz) 59.94fps looks like original 59.94fps (59.94Hz). All simultaneously on the same screen. So 1000Hz ain’t just for 1000fps. Once large-ratio frame rate amplification begins to occur in the 2020s, the average FRAT overhead can become lower than the frame transport overhead, which can significantly compensate! And higher frame rates makes it easier to score during fast-moving scenery in the same way that a 1ms-laggier 240Hz monitor can still provide better K/D ratios than a 144Hz monitor, since the reduced scanout latency more than compensates for the negligible increase in absolute latency. And, low frame rates also have less lag on ultra-Hz displays, thanks to the quick frame transport (QFT) effect of 1ms refresh cycle transmission (1000Hz = 1ms refresh cycle transmission). This quick frame transport effect can MORE than compensate for the ultra-tiny bit of added lag of a frame rate amplification tech. Which means 1000fps amplified from 100fps can have less lag than 60fps at 60Hz due to scanout lag. There are benefits for low-fps operation, too! This sounds amazing, but when will we realistically be able to experience it in action on PC? I could use those frames in my competitive shooters! While virtual reality games are now beginning to integrate and embrace these technologies today already (e.g. Robo Recall for RIFT VR is an amazing VR FPS with frame rate amplification!) — we need to see these amazing technologies filter down to traditional gamig monitors in the next few years. This is why I wrote this article, and I know many NVIDIA/AMD scientists are researching similar technologies, as it helps sell their product. We want to shake the outdated “laggy fake frames” fear mentality in the gaming industry with the new knowledge on making them non-fake-frames nowadays. My prediction: Early half of 2020s for various vendors to release non-VR variants/clones of Oculus ASW capable of at least 2:1 or 3:1 frame rate amplification ratio.